Our weapons are manufactured in Japan in a traditional way, by hand. Our main supplier is Nidome, whose workshop is located in Kyushu, in the southern part of Japan. He is one of the last Japanese craftsmen still active. Click here to learn more about that heir of an ancestral know-how. Wooden Sword There are 41 products. 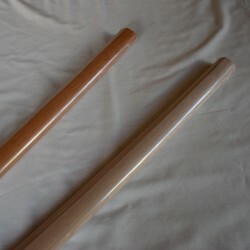 A bokken (boku: wood / ken: sword) is a wooden sword (called BOKUTO in Japan) used for AIKIDO, KENDO and KENJUTSU training. In general, its shape and size are similar to those of a katana but there are also models similar in shape to other types of swords. 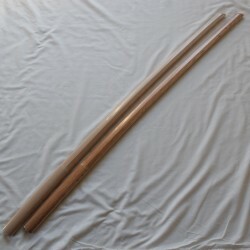 Originally, bokken were designed for samurai of feudal Japan to reduce the risk of injury during training. Our bokken are made in KYUSHU (south of Japan) at NIDOME in a traditional way and are of irreproachable quality. Our assortment includes a wide range of different models in terms of size, weight, shape, wood used, etc., at unbeatable prices, from very cheap prices for oak bokken to higher prices for ebony bokken. 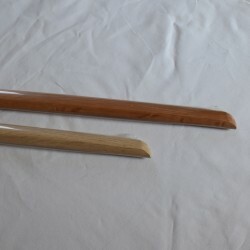 Two categories of Bokken are available: Standard Bokken for Aikido, Kendo or Iaido practice, and Bokken Koryu to practice the former Kenjutsu (Koryu) schools. 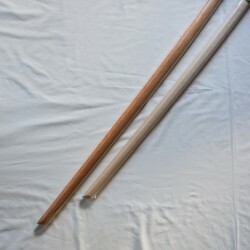 The Bokken of Nidome are very popular among Aikikai masters and many of them use them during their seminars and training. We also offer the possibility to engrave your name, the one of your dojo, your master, etc. on your bokken. Our laser engraving service is fast and cheap. Tanto is a wooden short sword, of about 30cm. It is used for Aikido and Kenjutsu. SINONOME offers different sorts of tanto of the NIDOME brand. Our supplier, NIDOME, is a specialist of wooden weapons (tanto, bokken, jo) since 1940 at Miyakonojo in Japan (90% wooden weapons are made in Miyakonojo.). 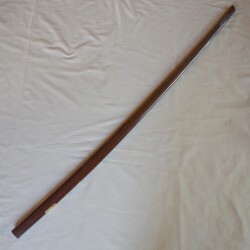 A tanto is a short wooden sword of about 30cm used in Aikido and Kenjutsu. This weapon, similar to a samurai dagger, allows to perform different types of attacks from different angles. It is mostly used to learn how to disarm a person with a knife. SINONOME offers different tanto from the brand Nidome. Our supplier NIDOME is a specialist in the manufacture of wooden weapons (tanto, bokken, jo) since 1940. His workshop is located in Miyakonojo, Kyushu, where 90% of the wooden weapons made in Japan come from. He is one of the last remaining Japanese artisans and, according to our team of experts, the one who offers the highest quality products, all with a perfect finish. 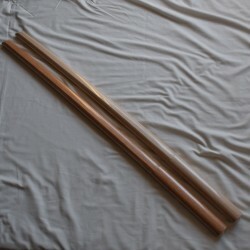 A Jo is a wooden stick of about 128cm long used for the practice of Aikido, Jodo / Jojutsu and Kenjutsu. Our Jo are made in southern Japan with a traditional method by one of the last craftsmen still in activity. In white oak, red oak or sunuke. Possible to engrave one's name or an inscription of one's choice on the Jo. Guaranteed quality, fast shipping, best price. We offer AIKIDO weapon sets of different sizes and weights, each containing a bokken, a jo and a tanto. All our wooden weapons are manufactured in Japan in a traditional manner by one of the best craftsmen still working and are of outstanding quality. Shoto is a short wooden saber of about 60 cm, also called Wakizashi or Kodachi. It is used mainly for the practice of the ancient schools of Kenjutsu (Koryu). Suburito is a bokken for training. 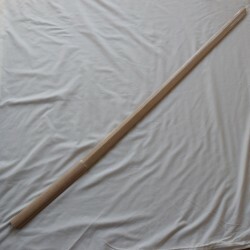 It is a little heavier than a standard bokken to improve the punching speed and strengthen the upper body muscles. Used for kata and suburi practice. Laser engraving on wooden weapons. When you order a wooden weapon (bokken, jo, tanto, shoto, suburito), you can add an engraving as an option. Engravings in Japanese (Kanji, Hiragana or Katakana). If you need help for a translation in Japanese, please contact us. Other accessories or options for wooden weapons. Onoha Itto ryu bokken - Oak (Heavy) White Oak / Red Oak Weight: 700g Length: approx. 98cm Onoha Itto ryu is an ancient Japanese martial art school (Kobudo). Made of Japanese Oak and made in Japan. When you touch this Bokken, you can see its naturally smooth surface. Iwama ryu bokken - Oak (Heavy) White Oak / Red Oak Weight: about 700g Lenght: 103cm This bokken is a litttle bit heavier than a standard one. Originally, it was made for Morihei UESHIBA, the founder of Aikido. 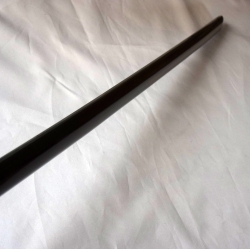 Bokken Aikido -Ebony (Heavy) Weight : about 650gLength : 103m It is heavier than Oak Aikido bokken with a slightly curved blade. 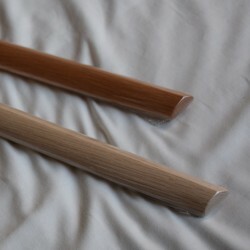 Aikido Bokken - Oak (Middle weight) White Oak / Red OakBokken weight: about 500gBokken length: 103cm Average weight, solid, very resistant to shocks against a bokken or a jo. 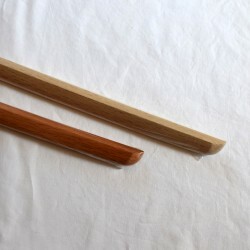 Bokken Yagyu Shinkage Ryu -Oak (Middle weight)White Oak / Red OakWeight: 400 - 450g approximatelyBokken Length: 102cm It is lighter than a standard bokken. It has a straight blade and a flat kissaki (the point of blade). Yagyu Ryu Bokken - SUNUKE (light) Weight: 400g Length: about 102cm Sunuke Yagyu ryu is a little bit heavier and more solid than Oak Yagyu ryu bokken and it has a shiny, beautiful surface.